During the 2017–2018 school year, the TBAISD Farm to School team partnered with nine area elementary schools. And at each school, they developed action plans for district needs. While each were different, they all revolved around one like-minded concept: promoting student health and wellness through engaging activities. These activities were centered around nutrition, fresh foods, and local agriculture. Their efforts didn’t stop once the school year ended. The Farm to School program has continued collaborating with the community all summer long with cooking classes and maintaining produce-filled gardens for the students to return to this fall. 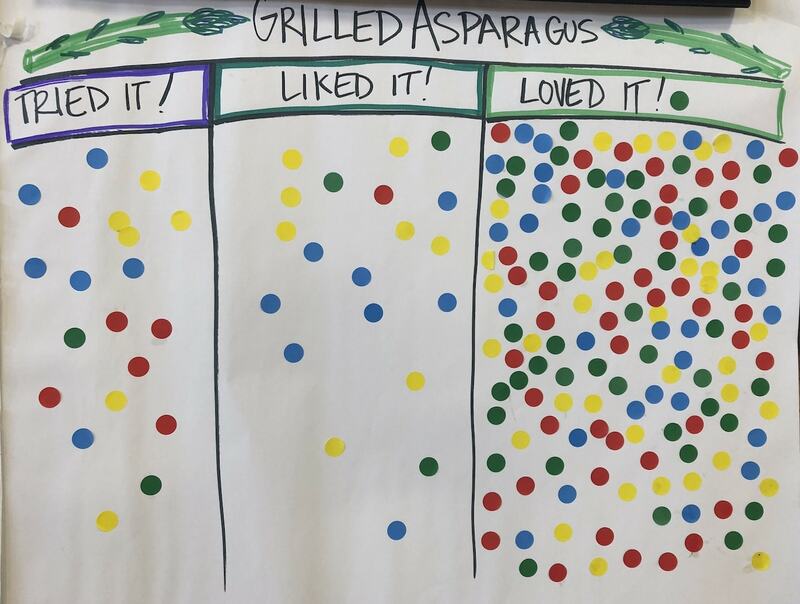 At Buckley Community School, Glen Lake Elementary School, Mill Creek Elementary School, Northport Public School, and Westwoods Elementary School, Farm to School partnered with Taste the Local Difference to host Pop-Up Farmers Markets during the school day. Bringing in local farmers, each market modeled what a traditional farmers market would look like. Students had the ability to experience the atmosphere, learn about new produce, and interact with farmers. 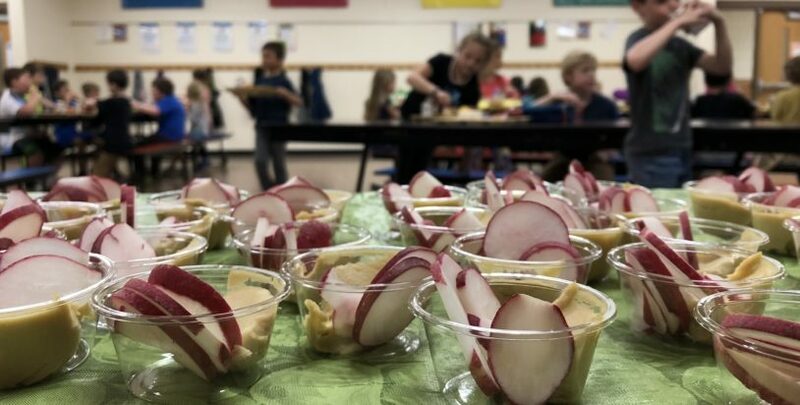 Each teacher was given a voucher to spend on fruits and vegetables for their class, then went back to their classroom to taste test or make something from what they purchased with students. Take your kids to a local farmers market or even to your grocery store’s produce section. Alice suggests asking questions like, “Have you ever seen an eggplant before? Let’s get one and try it at home.” Buying apples and making applesauce, or purchasing the most in-season vegetable (this will save you money), allows parents to educate kids on a variety of produce while simultaneously teaching the importance of fresh foods, local agriculture, and nutrition. If you’re able to stop by a local farmers market and talk with the farmer, that’s an added bonus. By making it personal and allowing students to see, for example, where a tomato comes from, gets them even more excited, shares Steve and Alice. 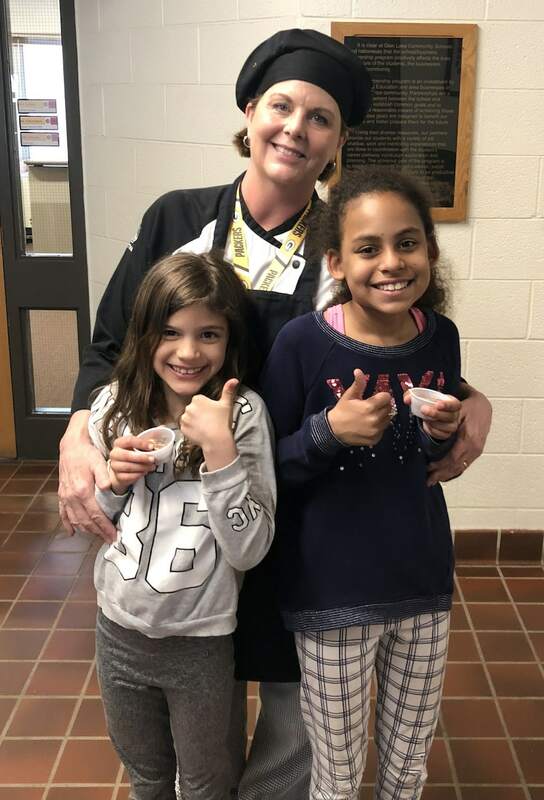 The Farm to School team visited Courtade Elementary School and Glen Lake Elementary to facilitate taste tests with elementary school students. The kids had fun trying a variety of fresh foods, from radishes to grilled asparagus and pears to cantaloupes. After sampling, they learned about local agriculture. Then, each student was able to vote at the end and have their voices heard. “Student voice is powerful,” Alice says. As parents, you can step outside of your comfort zone, too, and try something new at home. Keep in mind that “power of suggestion around elementary students is huge,” says Alice, so try out new textures and colors, knowing your child is going to be paying close attention to your reaction. TBAISD’s Farm to School program helped many schools with their gardens this past year. While they were all at their own stage of development, Farm to School was there to help. At Central Grade School, they helped refresh established school gardens. Students planted seeds and participated in activities that supported educational growth. They learned math skills while measuring garden area perimeters, discovered plant structures, and were taught Native American cultural elements from the Grand Traverse Band of Ottawa and Chippewa Indians. When the students return to school in the fall, they’ll help harvest their crop. Plant a garden! Whether it’s a container garden filled with herbs on your porch, a small garden bed in your yard, or a community garden plot, plant something fresh with your kids. You can not only introduce them to new foods, but teach them patience as their plants grow. Take a look at some great community garden resources here.